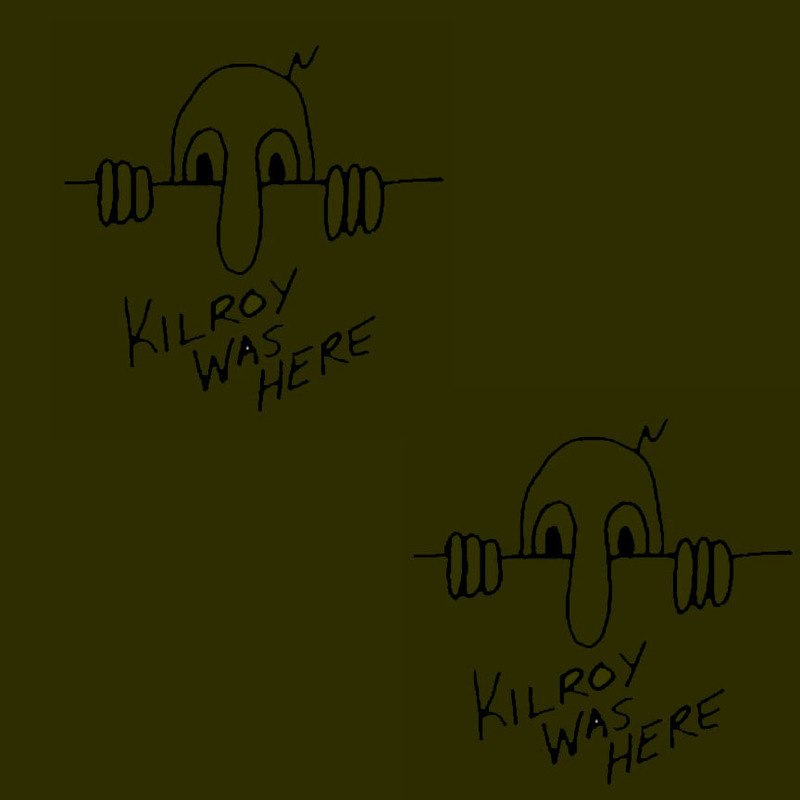 Where does Flory find items for his military attire ? ? Note the careful attention to color coordination. Rob Flory K2WI and Jr Op Martin setting up Friday morning. A perfect accessory found in the flea market. Friday morning it is raining , Pete Hamersma - WB2JWU is inside and dry and has finished setting up his display. Ten Meters 29.6 is becoming a popular push for the MRCA. Video: Gilbert Friday morning Rain. Mark Weidmayer, KD3ZK enjoys the traditional MRE. 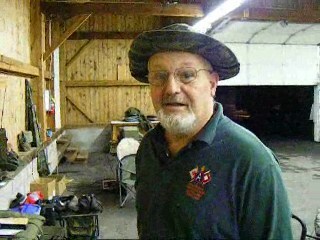 Martin sets up a "Road Runner" trap. The PRT-4 and PRR-9 are mounted on a removable plate. The assembly when removed from the "Emergency Transport" serves as a "hand held"
Rob Flory K2WI and Martin try out Bob Mc Cully's- AB8OP's, M274 Mule. Bob is very generous in sharing a rare vehicle. the rear wheels go left? Video: Flory rides the mule. Rob K2WI enjoy a tradition. 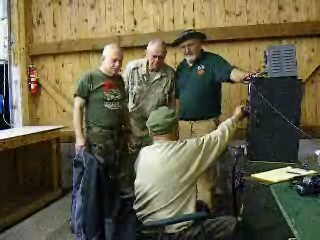 Ted W3PWW, Pete - WB2JWU, Lou N3OD,Steve KD3HT, do some late Friday night trouble shooting on Lou's PRC-47. Improvise, Adapt, Overcome . . .
No late night festivities on Friday, everyone must be worn out from Thursday nights "SLS" event. Every year at Gilbert I manage to pick up a radio project, I wanted a project, the longer I waited I got softer and searched and waited but found nothing on Thursday which is usually the best flea market day. And then when I came back Thursday evening it was waiting for me, delivered to my spot, just like room service , Jeff KG2BZ and Emido WA2FSX had dropped this off. A Federal Signal Life Boat Emergency Radio for 500 Kcs. I will miss you Emido. Charlie keeps an eye on my display. My Old stuff, "the new stuff is not any good". Friday night video K4CHE display. Video: late Friday night K4CHE display. Gate entrance early Saturday morning at the meet. Dave KB3ELD is an early riser. Video: Who is Up and Who is in the Rack. Cranking up the MKT-85 kitchen for morning chow. 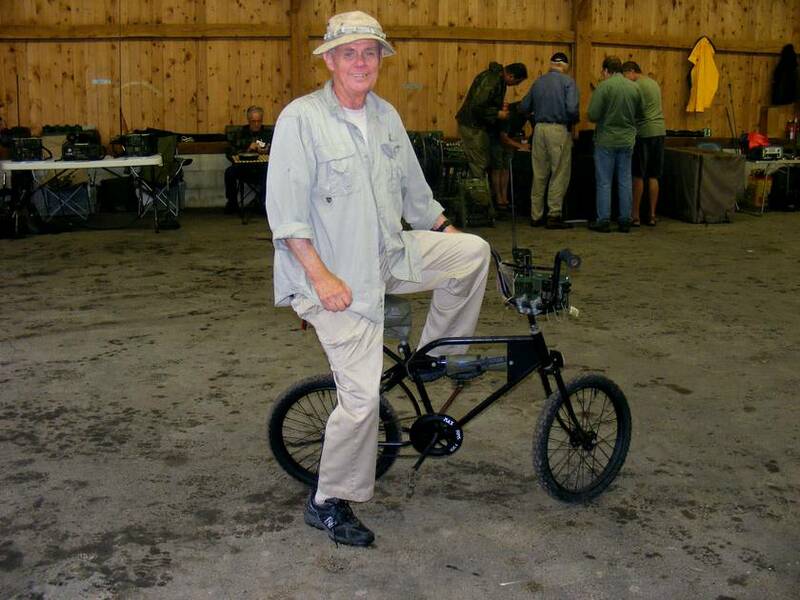 Video: some collect vehicles, other collect military radios and . . . Early Saturday, Ted W3PWW is up. Video: "I love the smell of MFP in the morning"
Video: BC-611 receving W4HWT inside the building. leave the building and venture out into the elements. A special NOTE: We are very fortunate to have the building and special thanks to Steve N3NNG for his coordination with the Redball Military Transport Association. 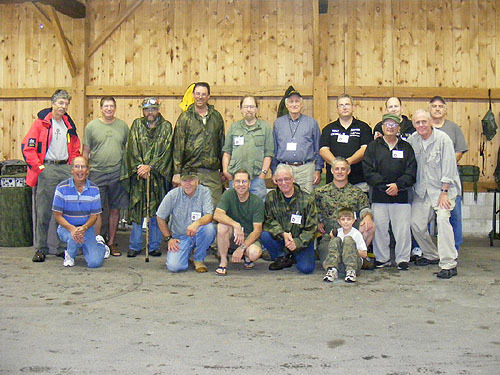 Standing in the rear row: Brown Beezer- W1NZR,Steve Gajkowski -KD3HT, Bob Mc Cully- AB8OP, Bernie Matyniak- W3OWE, Al Klase -N3FRQ, Charlie Di Cecca- KA1GON,Walt Skavinsky KB3SBC ,Justin Wheeler -KA3TIN,Scott Yenser, N3JZE.